Adultery, lies, deception, scandal, murder, cover-up, heartache, pain, and loss—stories with these sordid elements are relevant today. And women with shady pasts—labeled, shamed, and linked with tragedies—are part of our heritage. Bathsheba, a victim or temptress, Eve outside of Eden, Tamar posed as a prostitute, Leah stole her sister Rachel’s fiancé…Sarah gave Hagar to her husband and Rebekah masterminded a grave deception. How well do you really know the women of the Bible? i love this book! again, i absolutely LOVED this book! i loved how this book was written from the perspective of the women. it seriously kept my attention from beginning to end. and i was kinda sad when each story ended, i wanted to keep reading. 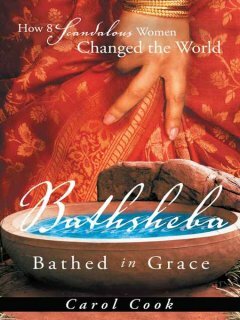 i think the thing i loved most about this book was seeing how God can take a woman the rest of the world might view as scandalous and use her for His glory! God thought so much of each of these 8 women that He put their stories in the Bible. think about that for a minute. sarah had her husband sleep with hagar to produce a son, yet God went on to honor His blessing to her AND put her story is the most amazing book ever! i loved reading of the faith these women had and about their own personal relationship with God. i would highly highly recommended this book to every single one of ya'all. it will definitely hold your attention and entertain you. it has strengthened my faith to delve into these deep parts of their lives. and it amazed me to see that the women of the Bible that i've always looked at as strong pillars also had doubts, jealousy and fears and that they dealt with the same day to day issues and you and i do.